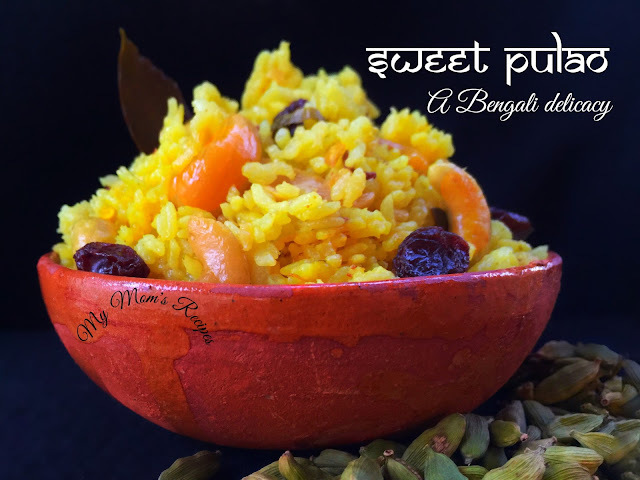 We all know the term pulao' - the pilaf' - in more easy words, the sweet or savory, rice preparation. Needless to mention, the main ingredient in every pulao' dish, is the rice. 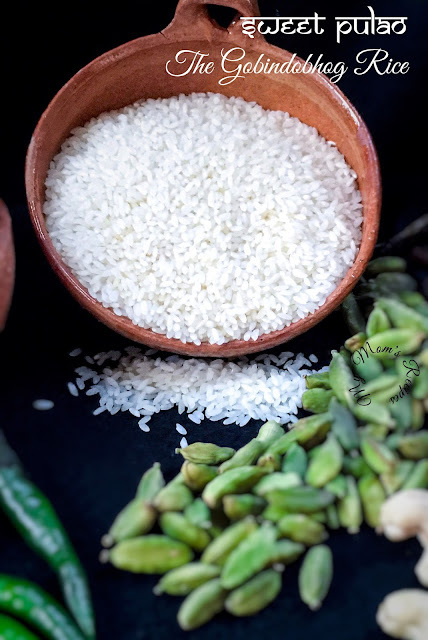 The quality and the aroma of the rice decides the taste and the flavor of the dish prepared. 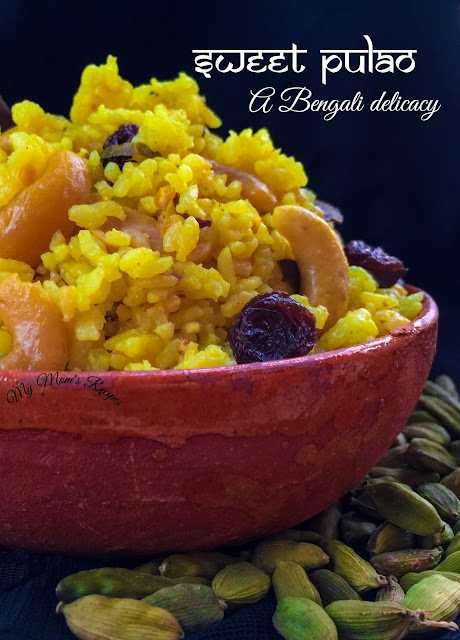 Here we're talking about mildly sweet, buttery flavored, short grain aromatic rice known as "Gobindobhog"
As the name suggests Gobindobhog - the principal ingredient used in the offerings served to Lord Krishna(Govinda). 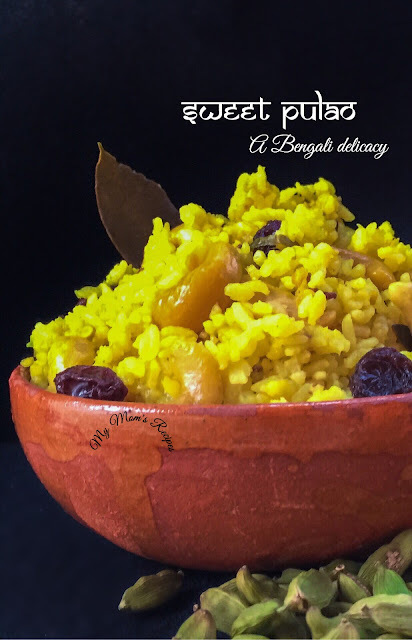 The combination of Gobindobhog rice, with its sweet buttery flavor and the pure ghee with its exotic aroma, makes this pulao, a dish from heaven. Traditionally, according to my mom-in-law, this extremely fragrant, mildly sweet, mishti pulao recipe requires a generous amount of zafran/saffron to achieve the bright yellow color. But since nowadays, generous amount of saffron requires a fat wallet, so it can be replaced by organic turmeric powder or yellow food color. I rest my case by adding enough strands of saffron dipped in milk along with a few pinches of organic turmeric powder. 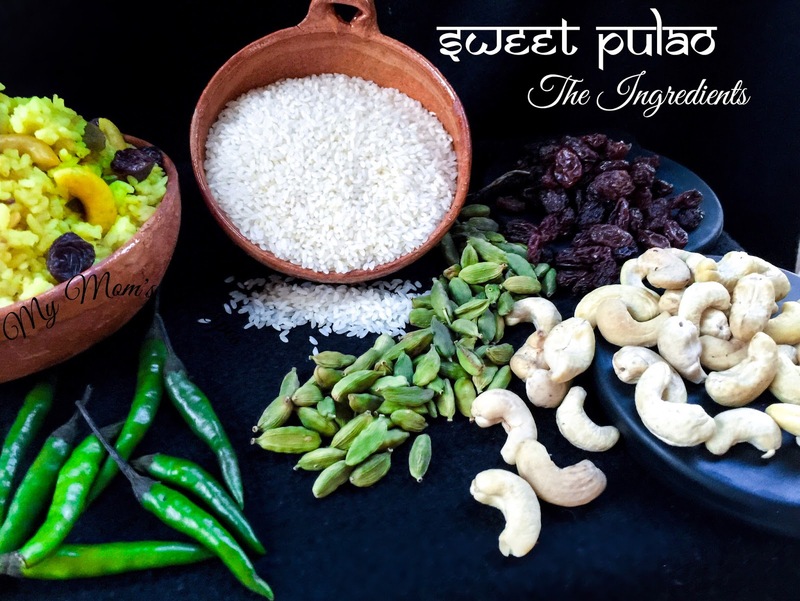 Watever alterations you make according to your convenience, the two main ingredients that cannot be replaced is the pure ghee(clarified butter) and the aromatic rice. But it’s not an easy job to find such a things if you are not living in Kolkata or West Bengal or the United States of America. Yes! most of the big Indian grocery stores here in States, carry a bag of either Gobindobhog or kalojeera rice. In case if you're not lucky enough to get one, with heavy heart you can also opt for long grain basmati rice - daawat or kohinoor(my personal suggestion). But please no craving for the gone taste then. The recipe is simple. The trick is the ratio. Just like basmati rice, Gobindobhog requires less water and less cooking time. Prepare every dish with more love and less ingredients, that's my mom's mantra of making the perfect tasty food. ~This aromatic rice needs to be washed once and soaked for atleast 30 minutes. The more the better. I did mine for almost an hour. As soon as the soaking period is over, drain and let it sit aside for again half an hour. So you did a single wash, soaked for a minimum period of 30 minutes, drain all the water and let it sit for another half an hour. My father in law prefers to dry the already soaked and drained rice grains on a plastic sheet, for atleast half an hour. According to him the soaking and drying process of rice grains gives the best aroma when sautéed in pure ghee, clarified butter. And let me tell you all, his preparation of making mishti pulao or bengali khichuri is the best I ever had till date. Heat 2 tbsp of ghee, clarified butter, in a heavy bottomed deep pan. I used my Futura pressure cooker. Lower the heat and add green cardamom, cloves, bayleaves and cinnamon. When the spices start to sizzle, add the slitted green chilies. Fry for 2-3 minutes and then add the cashews and raisins. Fry on low flame till the cashews turn light golden brown on each side – be careful, so that the cashews don’t burn. Add in the ginger paste and turmeric powder. Sauté for another 15seconds on low heat. Be very careful when sautéing ginger paste in hot ghee. It sputters a lot. Add in the drained-dried Gobindobhog rice. Gently mix everything so that the rice gets nicely coated with ghee and spices – do the mixing gently so that the rice grains don’t break up. Keep the flame low to medium, and gently sauté the rice for another 3-4 minutes. Add in the water now and increase the heat. Bring it to boil. Now it's time to add the namak-shamak and mishti (Salt n Sugar). Give a final stir, cover and lower the heat. Let it cook till all the water evaporates and rice is cooked. If using pressure cooker, for Futura, it should be 20 minutes on low heat. For the one with whistles, 2 are enough. In both the cases, let the rice sit for 10more minutes before opening the lid. Open the lid, lightly fluff up the rice with a fork. Add in the zafran, dipped in warm milk and one more tablespoon of ghee, clarified butter. Stir gently. Put the lid back on and let it sit for another 10-15 minutes. Goes best with deep fried fish or Kasha mangsho or Macher Kaliya, or just fill up big huge bowl with some fryums aside and dig in! !